My contribution at the BattleDay was to stage Pharsalus using some DBA options including the Double DBA format I proposed for Zama back in 2011. 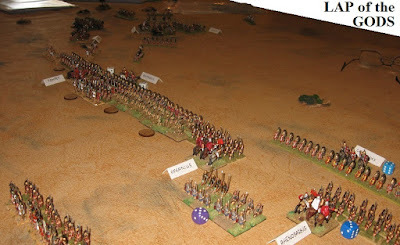 The scenario needs to compel the players to fight in depth ... giving them 2 DBA armies, one behind the other. 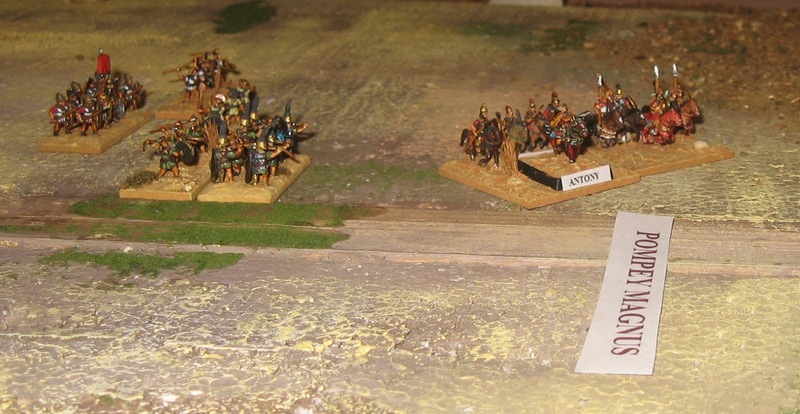 The first two should fight themselves to a standstill before being withdrawn. 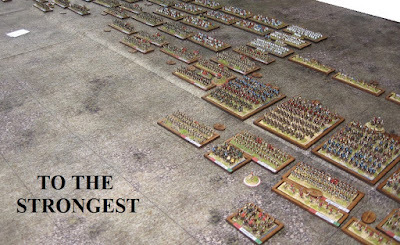 The clash of the main/reserve armies that follows should be the one that counts. 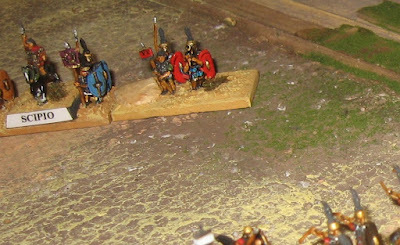 The figures, built on the Zama collection, are mounted on standard 40mm basewidths (just extra figures): I like the look - each base being a more convincing 'unit' in the smaller scale. 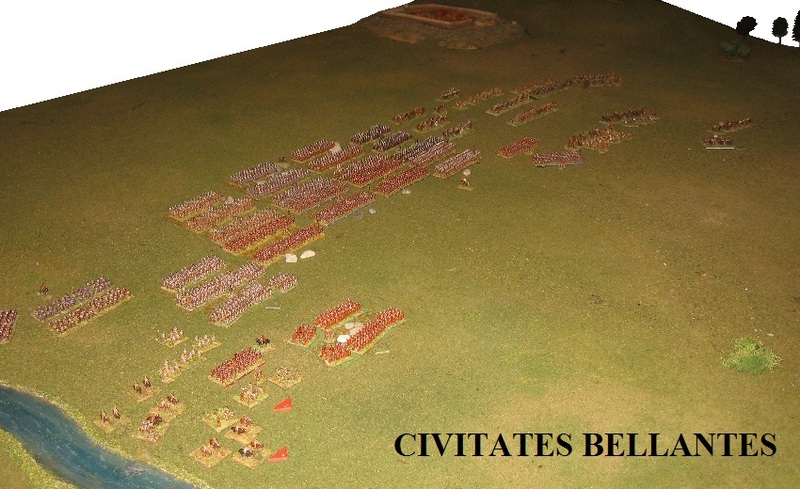 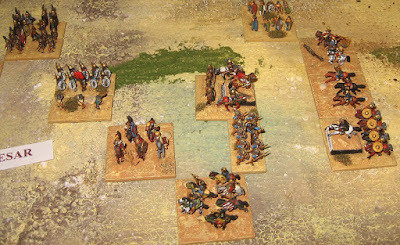 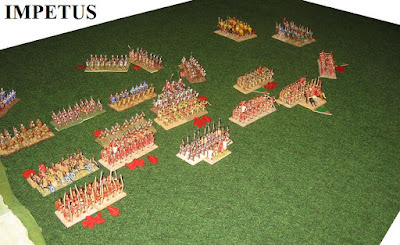 Although I had intended to play both the BB and Double DBA options, we focused attention solely on the latter - so while it was nice to see all the personalities and note their positions in the order of battle, we only needed 4: Calvinus commanding Caesar's opening phases, Labienus the Pompeians ... and Caesar and Pompey to command the decisive phase. 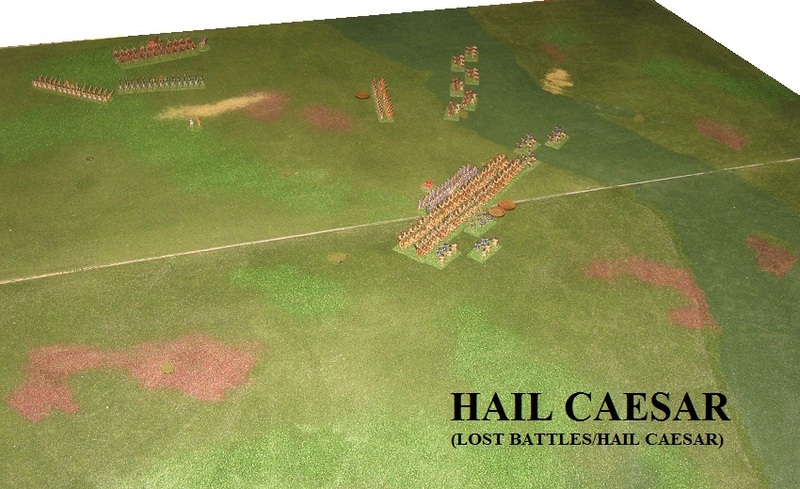 I used 72 elements, but due to the numerical disparities, split them 34 to Caesar, 38 to Pompey. 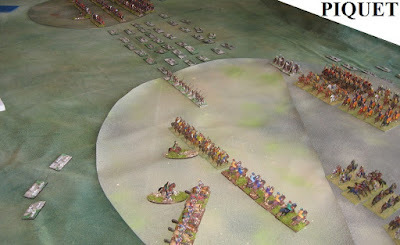 It would give Pompey a break point 2 higher. One of the challenges of the day would be to see if this asymmetry would unduly distort DBA's underlying balance. 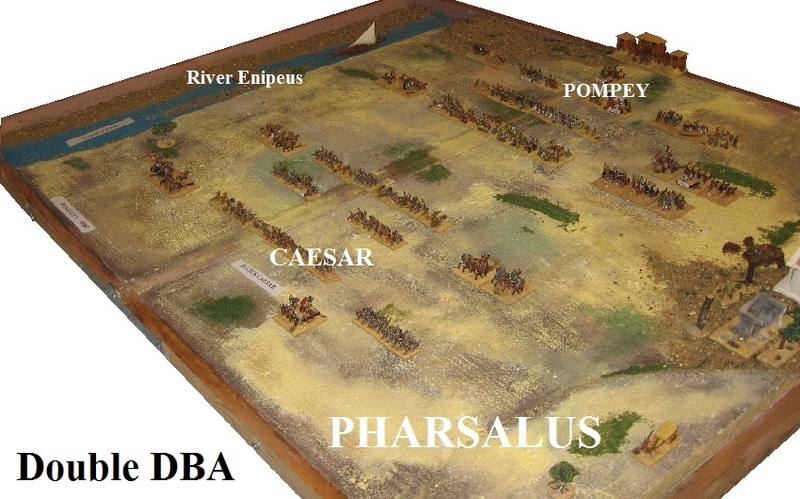 Actually we played the Double game twice with a win each to Pompey and Caesar ... not enough games to be remotely scientific but certainly a veneer of balance. 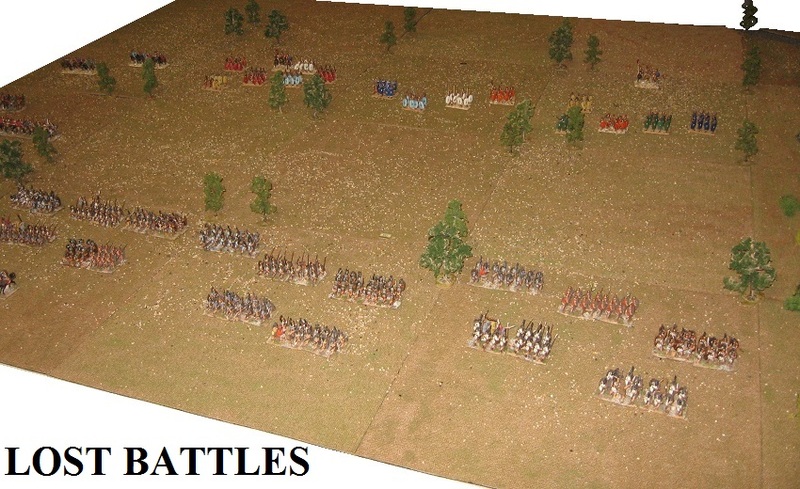 The decisive phase battle plays normally, one die per player, normal breakpoints and victory conditions. 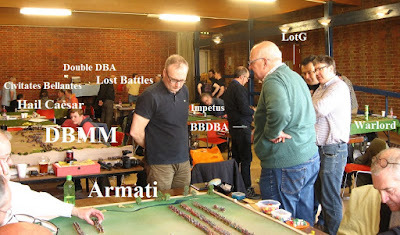 Players are so used to simultaneous battle with command one beside the other that fighting in the Roman style, commands in depth, seems almost heretical. 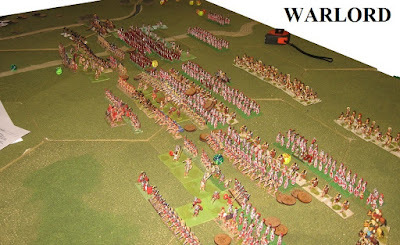 But it does work surprisingly smoothly. 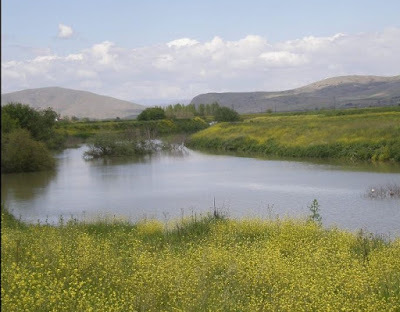 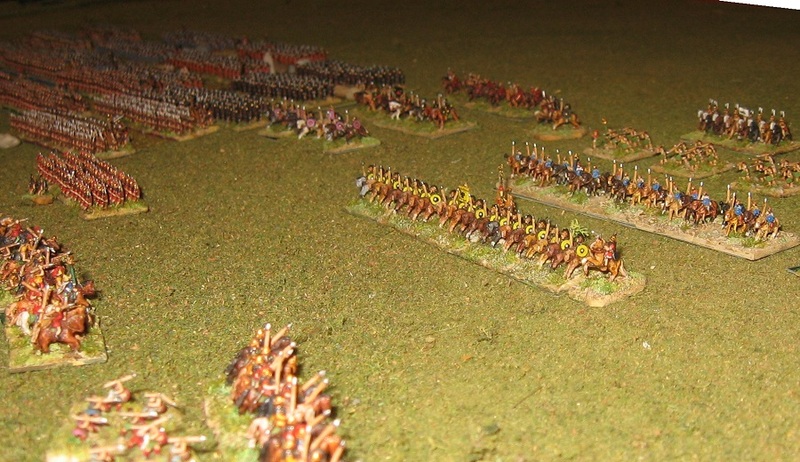 Both armies rested one flank on the river. 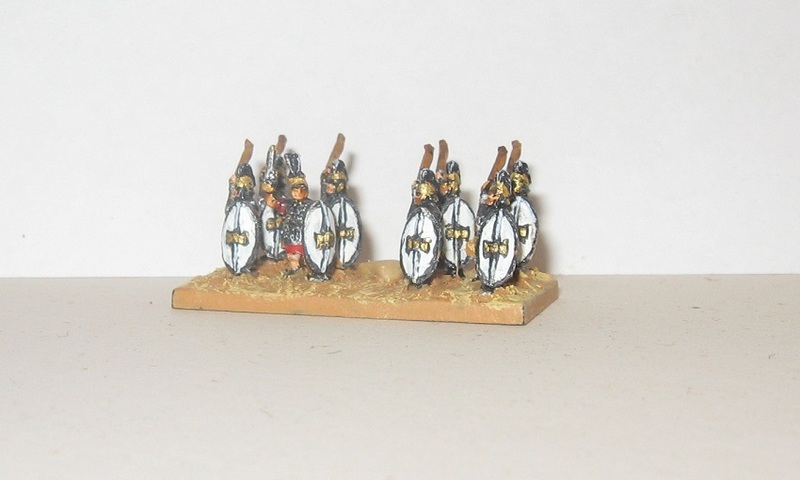 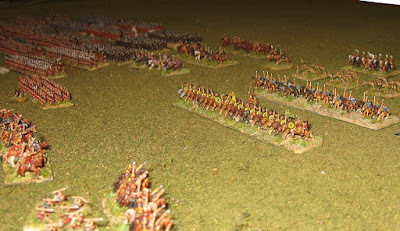 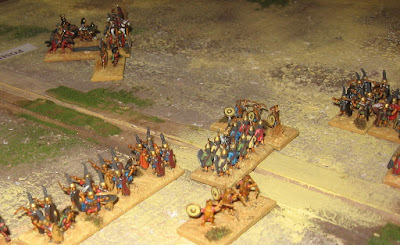 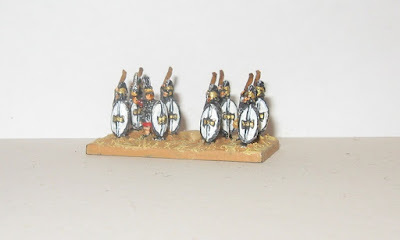 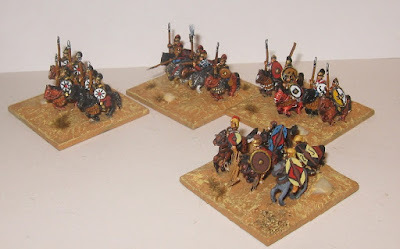 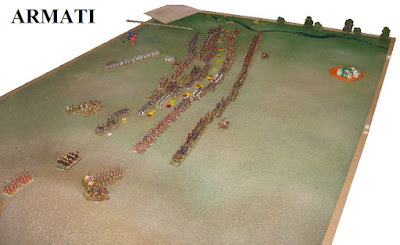 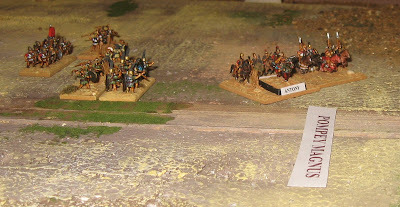 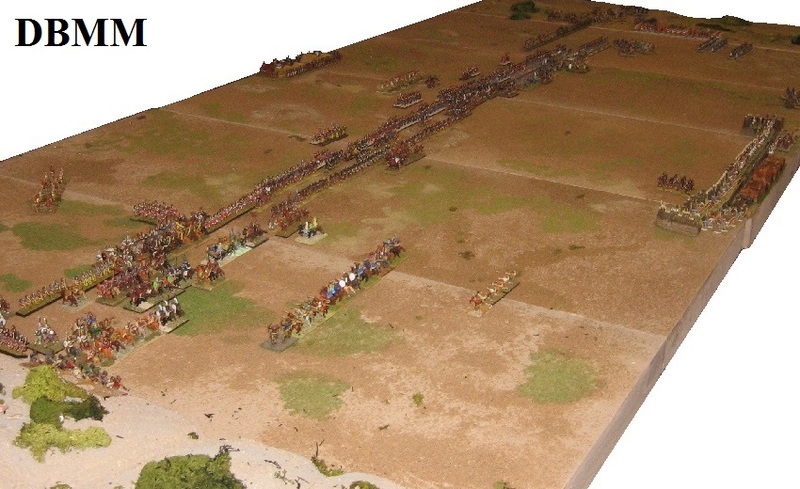 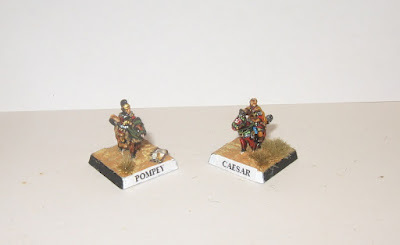 Caesar was woefully short of cavalry and his ploy of thinning his centre in order to deploy legionaries to shore the open flank was essential in the game. Caesar just does not have enough muscle or guile to hold off Labienus without the heavy infantry. Caesar's intervention stabilises the flank and neutralises Labienus's numerical advantage. 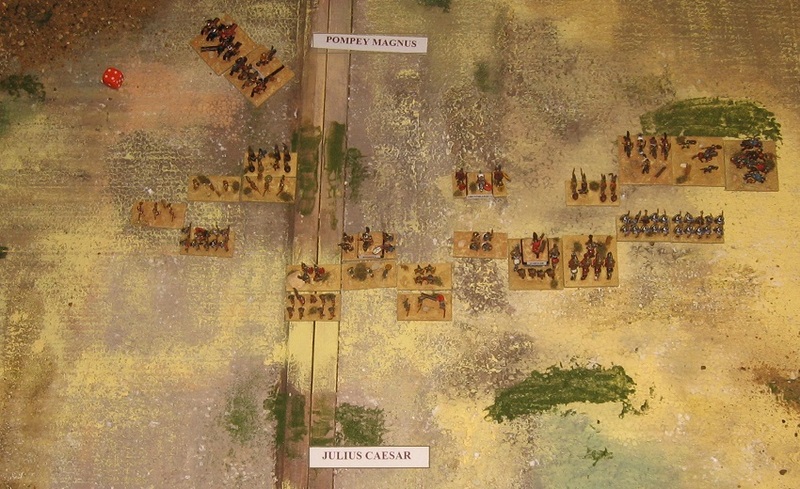 That said, Labienus has successfully drawn Caesar's reserves into the early phase of battle and these losses will be permanent. 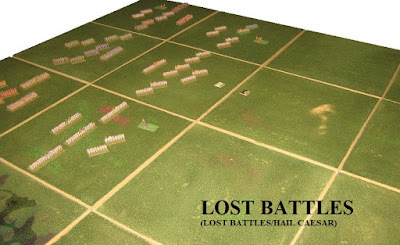 Obviously while without archaeology these images don't help identify the exact location or orientation of the battle, they perhaps do help give us a clue to look and character of the battlefield. 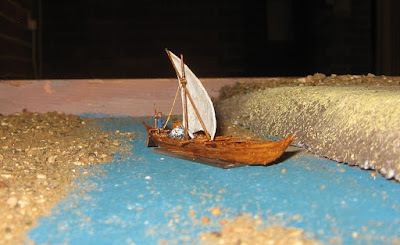 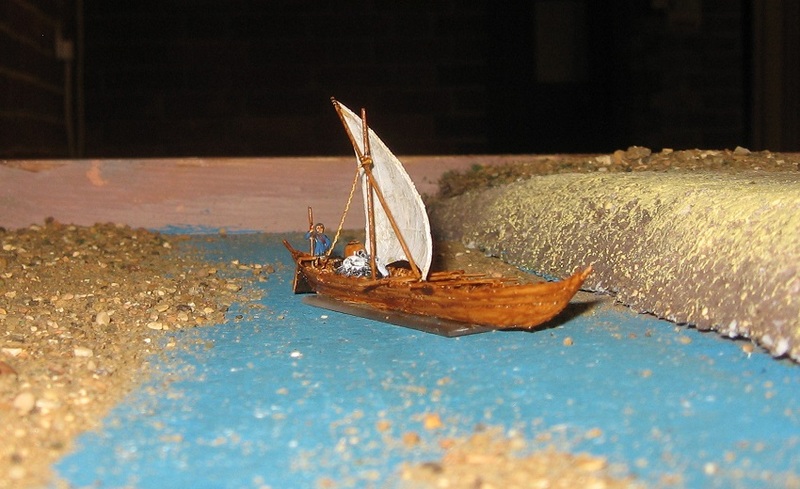 To add interest I made a boat for the river. The day started with an informative introduction by Lost Battles author Prof. Phil Sabin of Kings College and a lively Q&A. 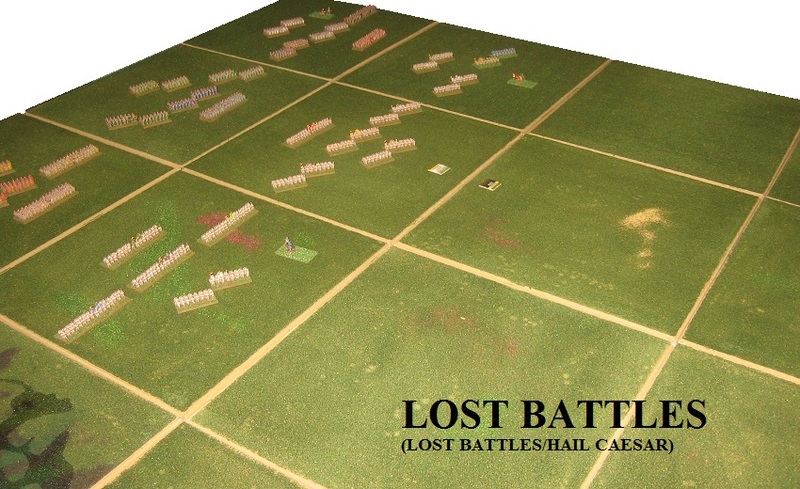 And Lost Battles appears twice ... once in the familiar Sabin/Cruttenden/Waller presentation, and then in a dual focus game which used Lost Battles for the big picture and Hail Caesar for the closer view. 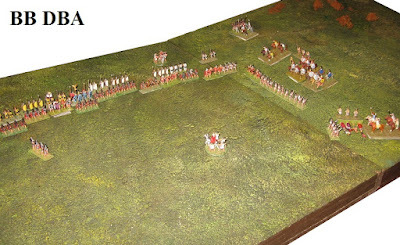 ... and smaller scale figures ... Pharsalus was a colossal battle and many presenters seem to have felt that smaller scales captured it battle (or games that mixed sharper focus with the big picture) ... 15mm predominated as usual but 10, 6 and 2 had a lot to say. 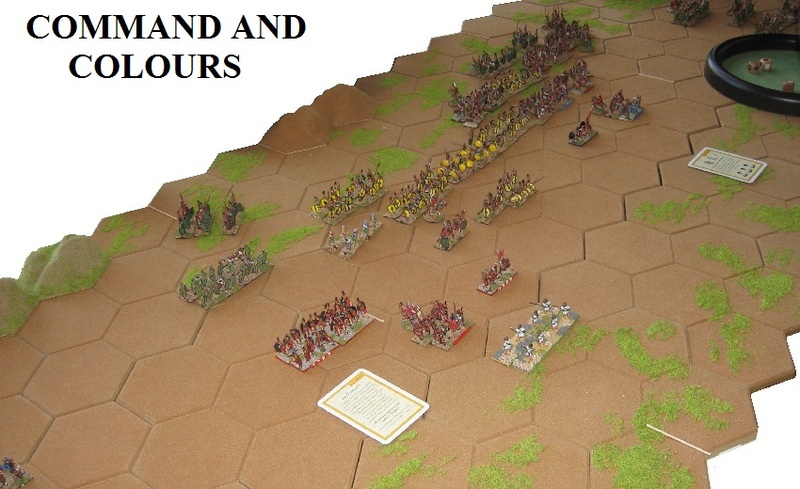 I will put a report on my own game in separate blog (to follow) and wrap up the overview here. 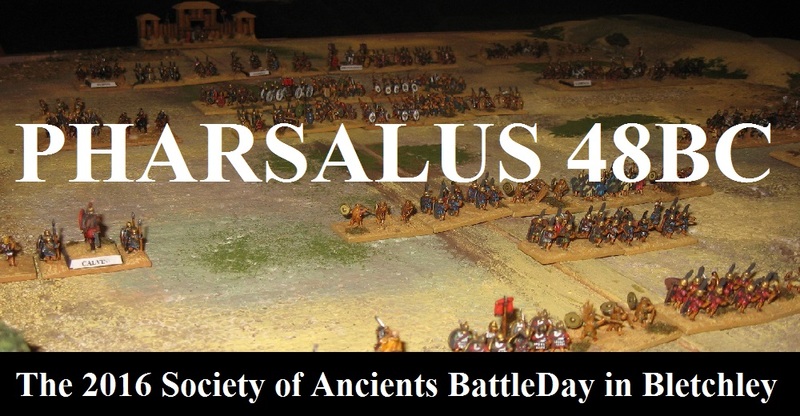 Well done the Society of Ancients ... another great battle recreated!